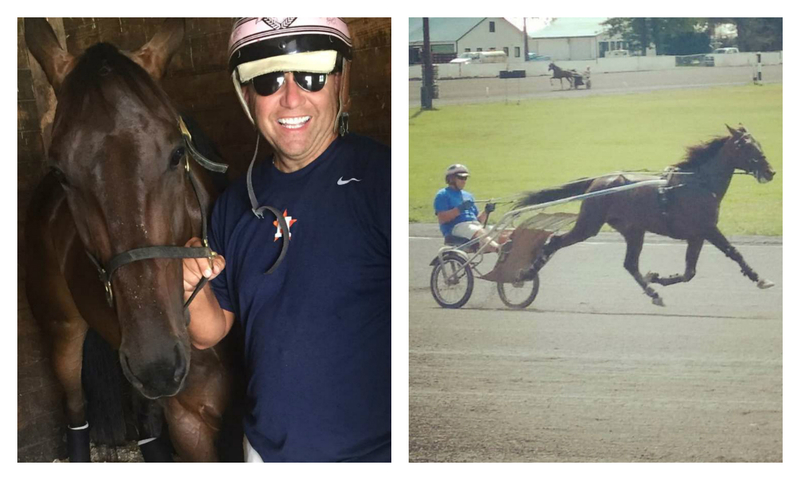 The accessibility of top names in the sport, including driver Stephane Bouchard (left) and retired Hall of Fame driver John Campbell (right), is one of the things that Springstead loves about harness racing. 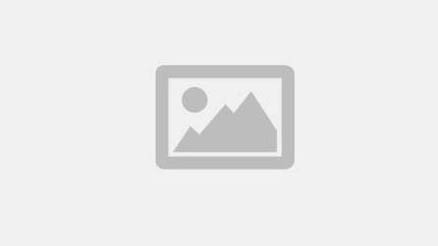 During the day, Michael Springstead is a sixth-grade teacher at Loudonville Elementary School in Loudonville, N.Y.
During the evenings, the 53-year-old Springstead is a cat mascot called SouthPaw for the Tri-City Valleycats baseball team. His son, Mikey, is the pig mascot. He has been teaching and has served as various mascots for more than 20 years. Springstead is also a big harness racing fan. “I’ve been involved for over 30 years,” said Springstead. “I liked horse racing; I wanted to be a jockey. A friend of ours was training, Gene White. One thing lead to another, and I was jogging. I was working with John Brennan and got my driver and trainer license. Springstead has been involved with harness racing for more than 30 years and jogs horses whenever he can. Photos courtesy of Michael Springstead. 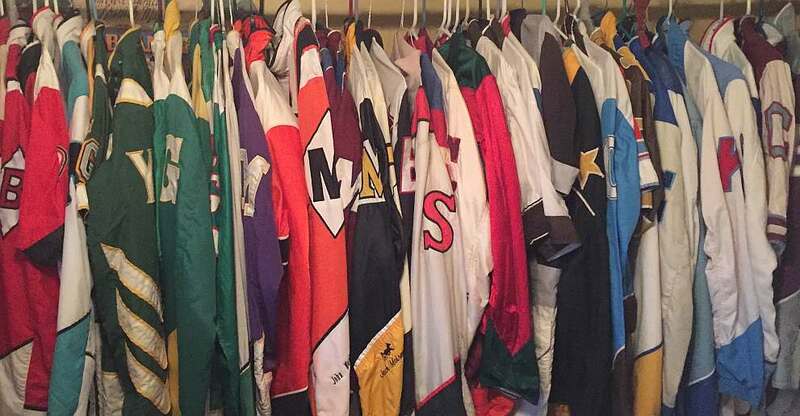 Although Springstead jogs when he can, his main focus now is on his massive collection of harness racing memorabilia. The colors started when he started working for Brennan. Springstead was collecting hockey jerseys from different teams at the time. Brennan suggested getting colors from drivers. “I started asking for colors,” said Springstead. “I had them all over my room. When I got out of the business, Brennan was able to get some sets for me. I can reach out to guys on Facebook. Most of the guys, when you show them your collection, they say that it’s like a drivers’ room. They are more than happy to give them to you. Springstead now has a collection of 60 sets of drivers’ colors. Springstead believes that people need to look at harness racing from a different angle; there is more to the sport than just betting. Springstead calls drivers the superstars of the sport, but unlike basketball superstar LeBron James or football star Tom Brady, a top driver like Yannick Gingras is more accessible to the average fan. He appreciates that and it has certainly helped him amass an impressive collection of harness racing objects.